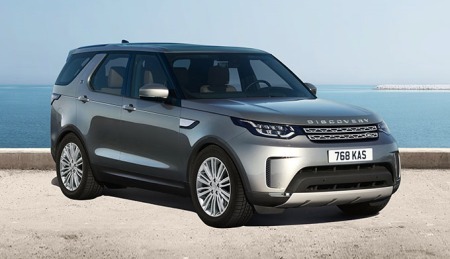 Land Rover Discovery is made by British car maker Land Rover. This car is mid size car SUV. It is a petrol version SUV car. . It borrows the 2.0-litre petrol motor from the Jaguar XE that develops 177PS and 340Nm. The Land Rover gets a 9-speed gearbox. This car beats other sports cars like BMW X3, Audi Q5 and the Mercedes GLC. This is recently launched car. Its top end HSE Luxury trim is powered by an SD4 2.2-litre oil burner that has high precision common rail fuel injection technology. The mill of this car is capable of returning a maximum mileage of 12.97 Kmpl. The other versions are shaped with a TD4 diesel mill of same size, which can return a mileage of 12.83 Kmpl. The top speed of 188kmph is capable by the top end version of this car. In just about 8.9 sec, this car can break 100kmph mark. The remaining versions of this car have the ability to achieve of speed 180kmph.In the meantime, it can break the 100 Kmph barrier is mere 10.3 seconds only. This brand new utility vehicle is the one that can redefine the concept of Urban SUV, thanks to its low stance and curvy edges. This version of the car look more classier in company's portfolio. On its front part, it has the atlas radiator grille with two slats. The headlight cluster on either sides are powered by projector lamps along with signature LED DRLs and turn blinkers. Just above, the bonnet is embedded with 'DISCOVERY' lettering that renders it an attractive look. Below this, the bumper is quite big and is housed with a wider air intake section featuring a perforated mesh. It also gets an aluminum finished lower guard along with LED fog lamps. On the side facet, its A and C pillars are in body color, while the B and D pillars are done up with black. Its wheel arches are fitted with slim fenders that falls into the line of its design language. The manufacturer is offering this SUV with 18-inch alloy wheels, but for the top end version, they are available as standard as an introductory offer. The rear section looks more attractive. Its taillight cluster has the signature lighting pattern as it is in the headlight cluster. This distinguishes it from the other SUV models in the company's portfolio. 'DISCOVERY' lettering that enhances its overall appeal. The interior of this car looks simple, but with its best quality. Thus car has dual tone color scheme, which is very eye-soothing, i.e, underlined by chrome and metallic highlights. Dashboard of this car has dual tone with layered design. This car also consists of a leather upholstery. The central part of the interior is the place where all controls and functions are situated. Dashboard consists of two analogue meters and an LCD display. Buyers can customize the cabin with their favorite color schemes and venners. Buyers can also buy seven seating option with bench seat at the third row. This new Discovery Sport model is introduced in four variants. Its base trim hosts a range of interior features like an air conditioning system, heated rear windscreen, global lock/unlock facility, convenience hooks, stowage units and interior lighting package. The next-in-line SE trim has aspects like a cruise control, two-zone climate control unit, load space cover, front and rear parking assistance along with passive entry facility. The mid range HSE version additionally has grained leather seats, 8-way electrically adjustable front seats, center console with sliding armrest, leather wrapped steering wheel and a rear view camera. The high end HSE Luxury has few more innovative factors like 10-way electrically adjustable seats with memory, two-zone climate control with air quality sensors, premium floor carpets and an auto dimming interior mirror. One of the best things about this sports vehicle is its spacious internal section. The interior dimensions are quite generous and this gives a comfortable feel to all its occupants. It can accommodate five people with much ease, while the owners can also opt for 5+2 seating arrangement. Ample head and shoulder room is ensured, while the leg space is also impressive owing to its long wheelbase. A large fuel tank is incorporated in it with a holding capacity of 65 litres. And, its boot compartment is spacious enough to take in huge amount of luggage. However, this space can be further increased by folding its rear seat. Under the bonnet, all its trims have a 2.2-litre oil burner that comes with a total displacement capacity of 2179cc. Its TD4 editions generate a peak power of 147.5bhp and yields rotating output of 400Nm. Meanwhile, the SD4 version is capable of churning out a maximum power of 187.7bhp at 3500rpm and delivers 420Nm torque at 1750rpm. This motor carries four cylinders, 16-valves and is based on a double overhead camshaft valve configuration. It is integrated with a common rail direct injection system. And, it is coupled with a 9-speed automatic transmission box that distributes engine power to all its four wheels besides enabling easier gear shifts. This engine can help the vehicle to accelerate from 0 to 100 Kmph in between 8.9 to 10.3 seconds depending on the trim. Numerous protective aspects are loaded in this vehicle that ensures a stress free driving experience to its occupants. A total of seven airbags are offered along with cut-off switch to passenger airbag. There are seat belts available for all passengers with audible warning notification on instrument panel. It has child seat ISOFIX anchor points in the second row, while the perimetric alarm with remote panic alarm system further enhances protection. Both the front and rear seats have head restraints that are adjustable in two ways. Its body structure comes with impact beams and enhances safety in the event of any collision. The advanced anti lock braking system along with electric brake force distribution and emergency brake assist are useful in boosting the braking mechanism. The dynamic stability and electronic traction control ensures maximum stability as well as traction during high speed and on slippery surfaces. The roll stability control minimizes the possibility of roll over during cornering, whereas the hill start assist holds the vehicle and prevents rollback or slippage. The 24x7 road side assistance is offered for all variants as standard, and it has power operated child locks on doors and windows. In addition to all these, the list also includes electric parking brake, reversing lamps, center high mount stop lamp, hill descent control, hazard lights under heavy braking, dual tone horn, trailer stability assist, as well as auto locking and crash unlocking system, which adds to the safety quotient.